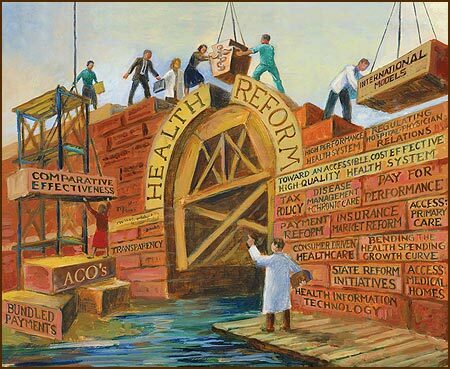 Accountable care organizations take up only seven pages of the massive new health law yet have become one of the most talked about provisions. This latest model for delivering services offers doctors and hospitals financial incentives to provide good quality care to Medicare beneficiaries while keeping down costs. A cottage industry of consultants has sprung up to help even ordinary hospitals become the first ACOs on the block. HHS recently released draft regulations on ACOs, here’s KHN’s story on the release. Yet the concept has been short on details. ACOs have been compared to the elusive unicorn: everyone seems to know what it looks like, but no one has actually seen one. But the health care industry has already embarked on a frenzied quest to create them as quickly as possible. Today, after many delays and false starts, the Obama administration proposedguidelines on how ACOs will work. Here is a brief guide to what we know about ACOs. When will ACOs begin operating? The ACO initiative is scheduled to launch in January 2012, but the race to form ACOs has already begun. Hospitals, physician practices and insurers across the country, from New Hampshire to Arizona, are announcing their plans to form ACOs, not only for Medicare beneficiaries but for patients with private insurance as well. Some groups have already created what they call ACOs. ACOs would make providers jointly accountable for the health of their patients, giving them strong incentives to cooperate and save money by avoiding unnecessary tests and procedures. For ACOs to work they’d have to seamlessly share information. Those that save money while also meeting quality targets would keep a portion of the savings. But some providers could also be at risk of losing money. HHS estimates that ACOs could save Medicare up to $960 million in the first three years. That’s far less than one percent of Medicare spending during that period. If the program is successful, it can be expanded by the Secretary of Health and Human Services. In Medicare’s traditional fee-for-service payment system, doctors and hospitals generally are paid more when they give patients more tests and do more procedures. That drives up costs, experts say. ACOs wouldn’t do away with fee for service but would create savings incentives by offering bonuses when providers keep costs down and meet specific quality benchmarks, focusing on prevention and carefully managing patients with chronic diseases. In other words, providers would get paid more for keeping their patients healthy and out of the hospital. If an ACO is not able to save money, it would be stuck with the costs of investments made to improve care, such as adding new nurse care managers, but would still get to keep the standard Medicare fees. The law also gives regulators the ability to devise other payment methods, which would likely ask ACOs to bear more risk. For example, an ACO could be paid a flat fee for each patient it cares for. Primary care doctors who are part of an ACO would be required to tell their patients. But although physicians will likely want to refer patients to hospitals and specialists within the ACO network, patients would still be free to see doctors of their choice outside the network without paying more. ACOs also will be under pressure to provide high quality care because if they don’t meet standards, they won’t get to share in any savings – and could lose their contracts. Who’s in charge — hospitals, doctors or insurers? Some regions of the country, including parts of California, already have large multispecialty physician groups that may become an ACO on their own, likely by networking with neighboring hospitals. “A lot of health care organizations are going to dust off the existing structures they had in place” in the past, Devers says. In other regions, large hospital systems are scrambling to buy up physician practices with the goal of becoming ACOs that directly employ the majority of their providers. Because hospitals usually have access to capital, they may have an easier time than doctors in financing the initial investment required by an ACO. Some of the largest health insurers in the country, including Humana, United Healthcare and Cigna, already have announced plans to form their own ACOs. Insurers say they can play an important role in ACOs because they track and collect data on patients, which is critical for coordinating care and reporting on the results. If I don’t like HMOs, why should I consider an ACO? ACOs may sound a lot like health maintenance organizations. “Some people say ACOs are HMOs in drag,” says Devers. But there are some critical differences – notably, an ACO patient is not required to stay in the network. Steve Lieberman, a visiting scholar at the Engelberg Center for Health Care Reform at the Brookings Institution and the president of Lieberman Consulting Inc., explains that ACOs aim to replicate “the performance of an HMO” in holding down the cost of care while avoiding “the structural features that give the HMO control over [patient] referral patterns,” which limited patient options and created a consumer backlash in the 1990s. Many health care economists fear that the race to form ACOs could have a significant downside: hospital mergers and provider consolidation. As hospitals position themselves to become integrated systems, many are joining forces and purchasing physician practices, leaving fewer independent hospitals and doctors. Greater market share gives these health systems more leverage in negotiations with insurers, which can drive up health costs. Are there any possible legal concerns? Doctors, hospitals and others in the health care industry have raised concerns that ACOs could run afoul of antitrust and anti-fraud laws, which try to limit market power that drives up prices and stifles competition. One concern is that ACOs, particularly those in rural markets, could grow so large that they would employ the majority of providers in a region. To help providers avoid legal problems, the U.S. Justice Department’s antitrust division promises to provide an expedited antitrust review process for these new doctor-hospital partnership.